The Rasera is genuinely one of the best places to stay in Morzine. 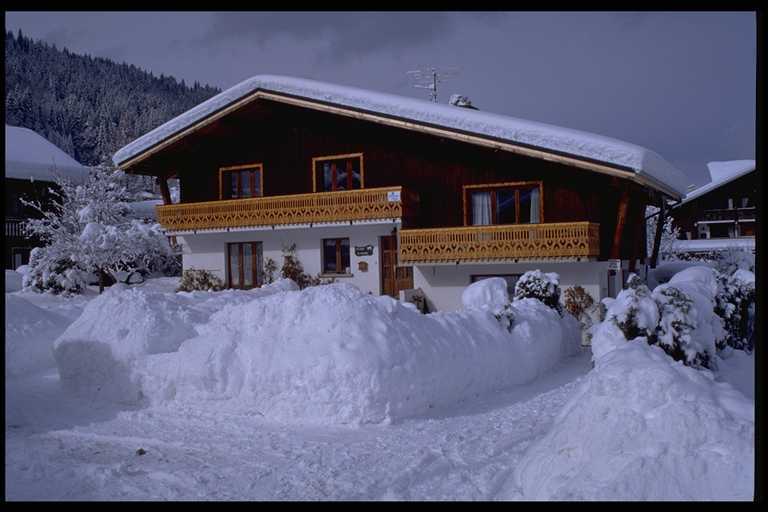 Whether your priority is comfortable accommodation, proximity to the lifts or central location, Chalet Rasera is just perfect. It's right in the centre of the town, yet on a quiet side street, set in a large garden with plentiful car parking and garage. The Pleney slopes, the French, International and British ski schools are all just a snowball's throw away, the Pleney telecabine and the ski hire shop are 2 minutes' walk, while the Super-Morzine lift (for piste access to Avoriaz) is just 5 minutes' walk from the chalet. In good snow conditions you can ski to within 50m of the chalet's door! The chalet itself is spacious and welcoming, with a log fire as the central feature of the living / dining room, with comfy sofas and a large oak dining table. There's a TV (with UK Freeview and French Freeview), DVD, Free wi-fi, and stereo CD player. On the ground floor is a shower room and separate WC. Up the main staircase are the largest bedrooms: 2 spacious triple bedrooms (each with double bed and single bed) with large balconies, a twin room, and a large bathroom with bath & WC, and a shower room with WC. The chalet entrance hall also opens onto 2 annexes. The lower annexe on the ground floor has 2 bedrooms (1 large double with handbasin and 1 twin), with an extra single bed in the hallway, sleeping up to 5, with its own bathroom (shower and WC). The upper annexe sleeps up to 5 in 3 bedrooms (1 double, 1 twin, and 1 mezzanine single), with its own bathroom (shower and WC). The kitchen has full-size cooker, microwave, dishwasher, handblender, food mixer, toaster, kettle, and ample tableware for groups of up to 16. All linen, 2 pillows and 2 towels per person are provided. If booked self-catered, cleaning is not included and costs €100 extra. Extra catering & cleaning services are available; for example you can book the chalet part-catered (from 1 night up to 7 nights), or have a dinner-delivery service, or a daily or twice-weekly clean. Contact us for details.